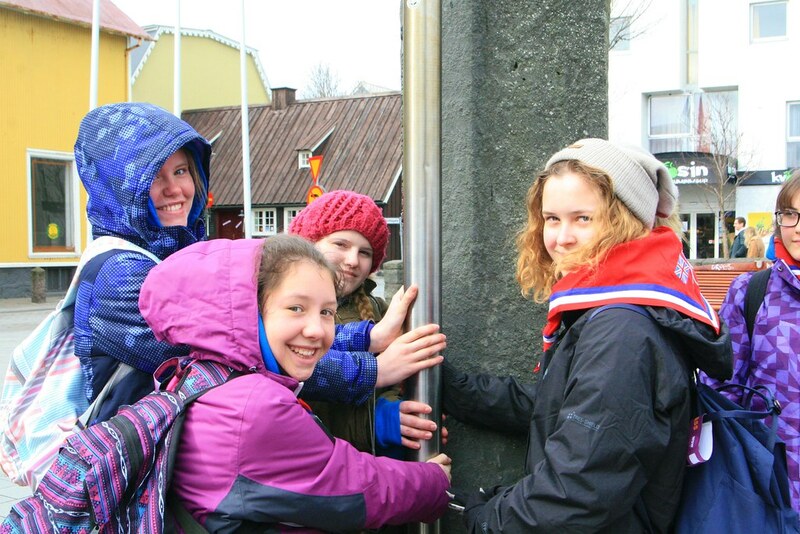 During the Easter Holiday, I was lucky enough to have the opportunity to lead a trip to Iceland with Girlguiding. This trip has been in the pipeline for some time, and my county, Middlesex East, had never done an international trip before. 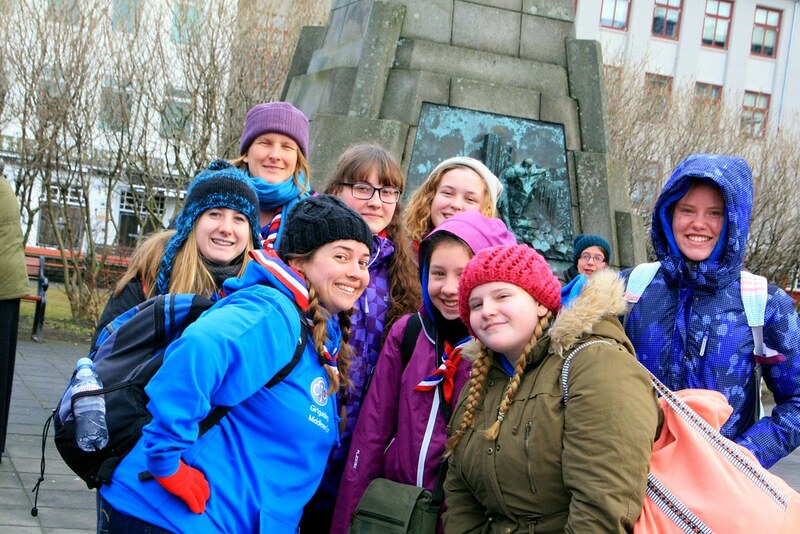 But international projects are my favourite part of Girlguiding, and so after months of planning, we made it happen, and group of 14 intrepid explorers made their way to the most beautiful arctic island. Welcome to Iceland! We numbered 14 in total: 5 senior sections members and 9 adult leaders. And pretty much all excited when we assembled at Gatwick to board our flight. We stayed for a week in a scout centre which was wonderful (more on that later) and packed in as many activities and excursions as we could. Over the next few weeks, I'll be sharing some of our experiences as I think it's safe to say we had a fantastic time! 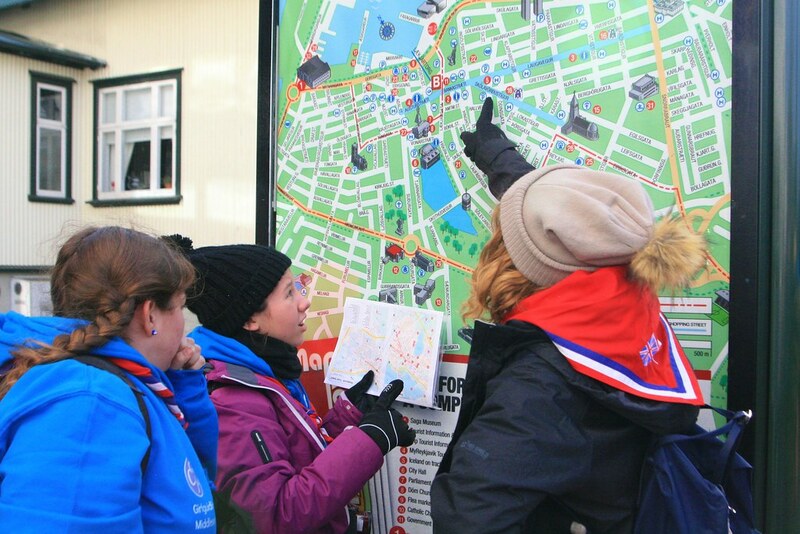 Our first full day in Iceland was spent exploring the capital city of Reykjavik, and we went on a walking tour with a history teacher who was an absolute wealth of historical and political information, and who had a great sense of humour! 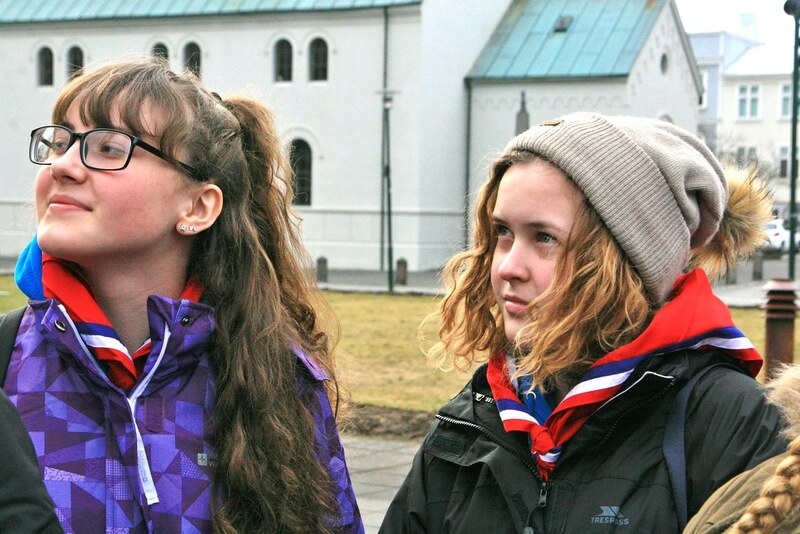 She shared so much of her cit with us and we really felt that we got an insight into the Icelandic way of life. 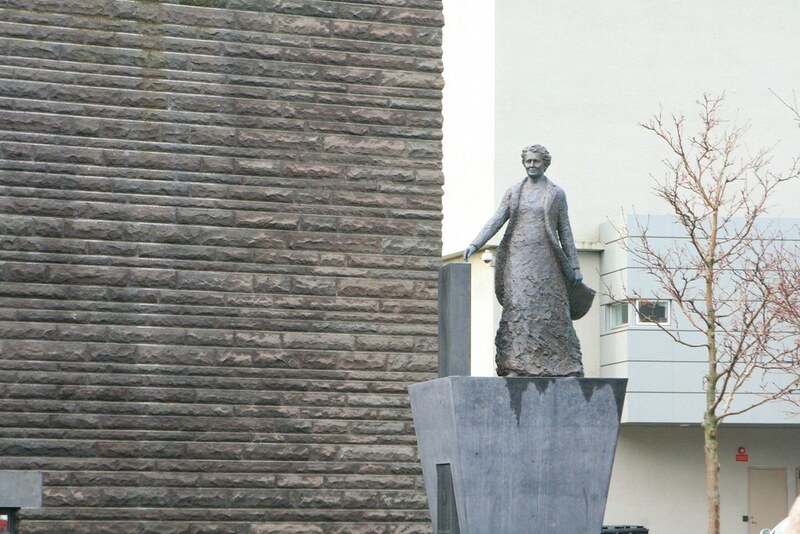 For instance, while visiting the Parliament building, that Iceland first gave women the vote in 1915, and they had their first female MP in the 20s. Today's parliament is made up of 63 members, 29 of whom are women. 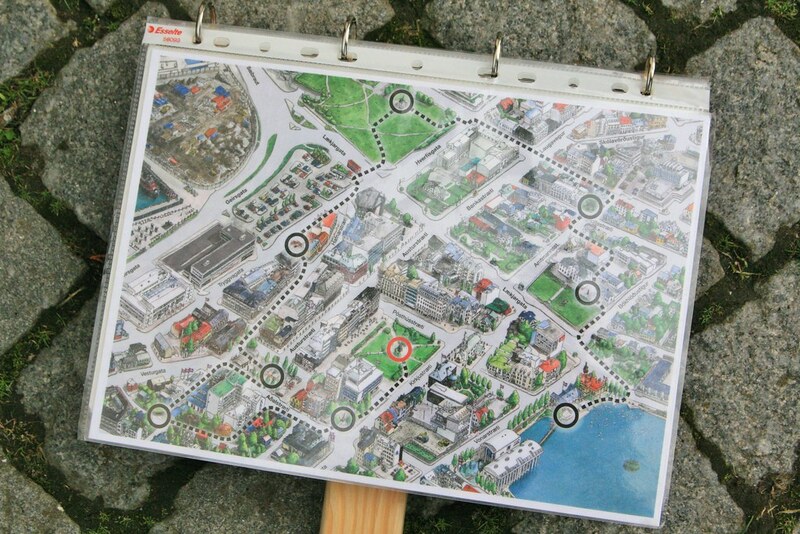 Our route took us all around the city and Sara, our guide, pointed out places that we might like to return to. We learned that the crime rate in Iceland is the lowest in Europe, which makes it a very safe and welcoming place to visit. Iceland produces all its own energy renewably through geothermal energy, and the energy is free to Icelandic citizens: they pay only for the maintenance and upkeep of the system. We felt there is probably a lot we could learn about being environmentally friendly from Iceland. 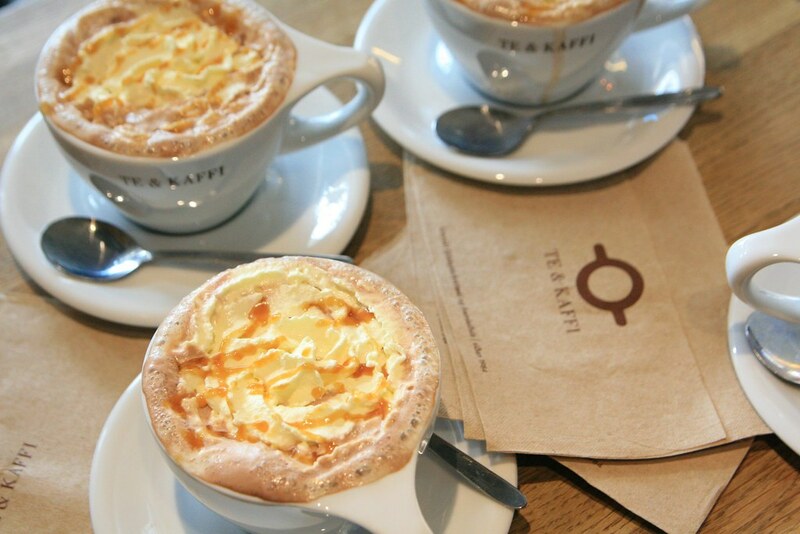 ...but a round of hot chocolates actually did a better job. Everyone we met was so helpful and friendly, and even when we all piled haphazardly into a coffee shop requesting hot chocolate, the staff laughed and offered to make us caramel or mint hot chocolate as bonus. YUM. And whipped cream is a must. For purposes of keeping warm. In the afternoon, we handed over the reins to our Senior Section members. We said they could go and visit any of the sights they liked, but they had to navigate. This led to some robust debate and discussion, and eventually, they worked out which way to go and we set off. 5 minutes later, we walked back down the road in the opposite direction, definitely on the right path this time. 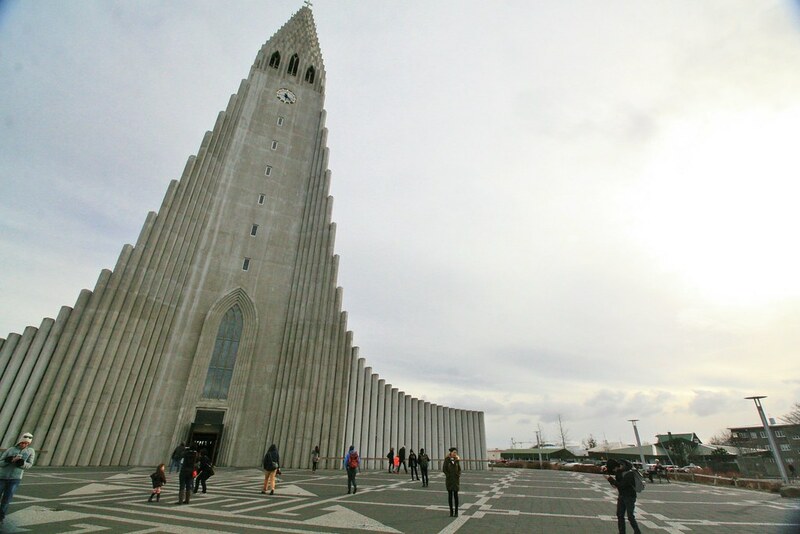 When we were dropped off in the centre, the lovely driver of our minibus told us it's impossible to get lost in Reykjavik, as you can always see the church on the hill, and you can remember that the mountains are to the north. Well, I found there were plenty of times when we had no idea where the church was, and mountains seemed to be on at least 3 sides of the city, so for navigation, we stuck to the map. Boom! Reykjavik is a lovely city; in fact it doesn't feel like a city at all. It's colourful, with pretty houses in pastel shades peeping around every corner. (See previous post here) The streets are wide and the buildings don't crowd you, and there's very little traffic. With only a couple of hours left to explore the city, we headed to a flea market in order to pick up some much needed souvenirs. Where would we be without postcards to send home, and the all-important badges for our camp blankets?! We decided to get in a visit to the concert hall on the banks of the habour as it's a spectacular building, but lunch was starting to seem a long time ago, and it was drizzling a bit.... Only one thing for it. 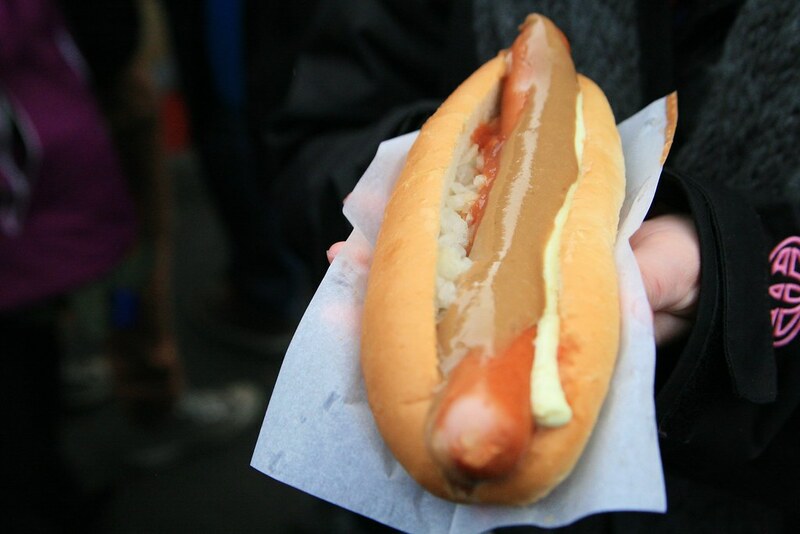 A snack stop at the hotdog stand recommended to us by our guide Sara! 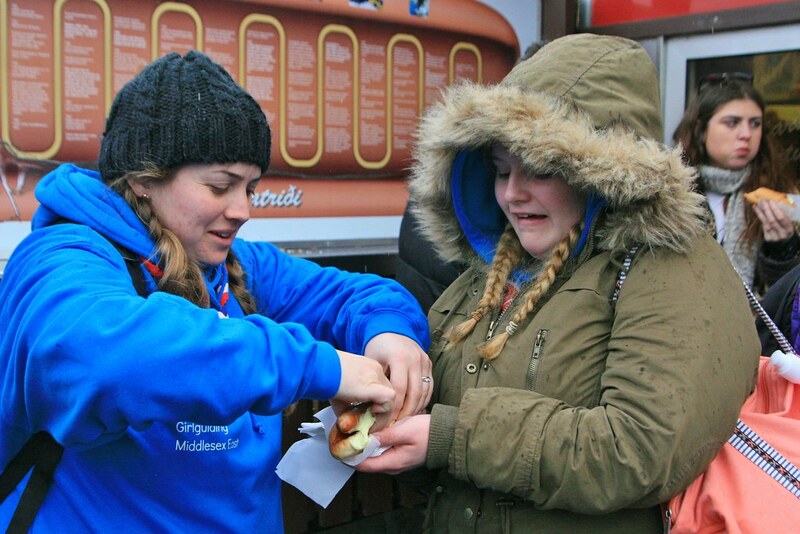 The stand had a queue every time we walked past it, which was a good sign, and we decided to share the hotdogs so we could all get a taste. We weren't sure what to expect, but had been told to order one "with everything". So we ordered our hotdogs with everything! 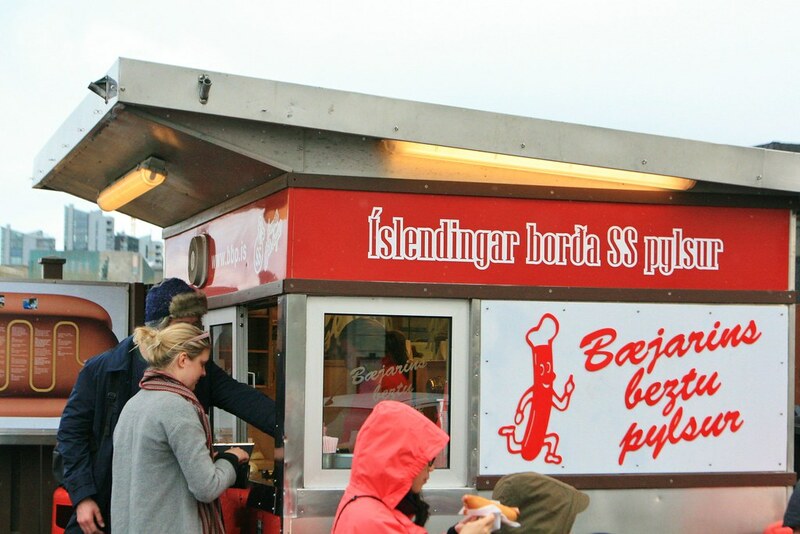 It turns out this means a sausage made with beef, lamb and pork, served in a bun with crispy onions, raw onions, ketchup, mustard and a pale brown sauce that doesn't seem to have an English translation. But not the easiest thing to share. Still, the group gamely experimented with a variety of different approaches. This gave everyone just enough energy to make it to the concert hall before meeting the bus. And before having a go in search and rescue team's vehicles... but that's another story for another day. P.S. I'll be back for more adventures of Girlguiding Middlesex East over the next few weeks. 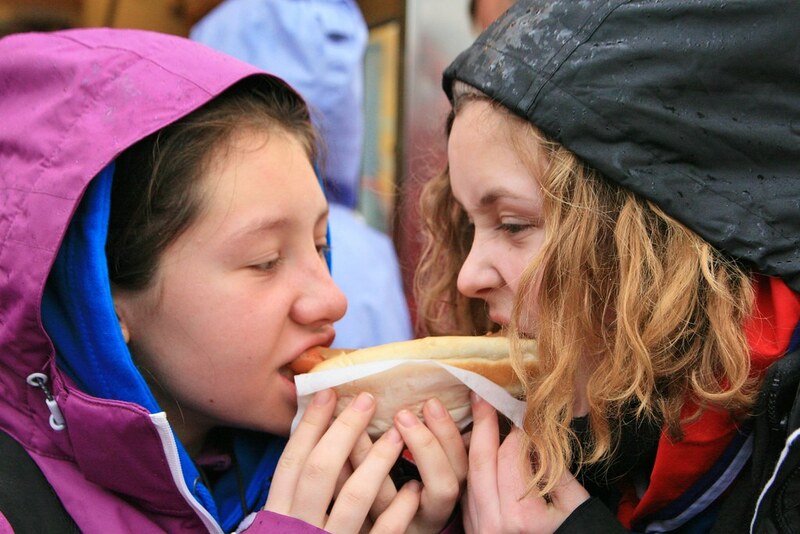 But for now, I'll just leave you with the thought that it's a good job that we shared the hotdogs. Because when we got back to the scout centre, the wonderful QM had decided that as the weather was so warm, it was time to break out with the barbecue and have burgers for dinner! It was about 6 degrees.